"To celebrate their twenty-fifth wedding anniversary, Grace has planned the surprise of a lifetime for her husband—a romantic getaway to Paris. But she never expected he’d have a surprise of his own: he wants a divorce. Reeling from the shock but refusing to be broken, a devastated Grace makes the bold decision to go to Paris alone. Grace can’t believe how daring Audrey is. Audrey can’t believe how cautious newly single Grace is. Living in neighboring apartments above the bookshop, this unlikely pair offer each other just what they’ve both been missing. 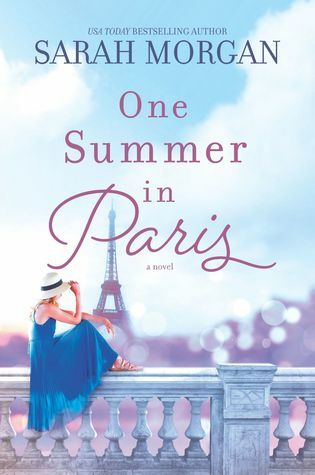 They came to Paris to find themselves, but finding this unbreakable friendship might be the best thing that’s ever happened to them…"
Let me just start off by saying that I adored this book! I feel like whenever I have this strong of feelings on a book that I have a tendency to ramble and gush so heads up that's probably what you are getting here. The thing I loved most about this book though is how easily I connected to it and the way it made me feel. Let's start at the beginning here though. This book is told from two different points of view - Grace, who is a middle-aged woman whose husband has recently told her he wants a divorce, and from Audrey, a young girl with a really crappy home life. Now for the record I'm happily married so that's not actually why I connected to Grace so easily (although it was sadly easy to imagine/understand what she was going through). I connected to Grace's character because she had so many similarities to me in other ways. Before her life completely changed, she was comfortable with her life. I say comfortable in a way that isn't necessarily a good thing. It's easy as a woman and mother when you've been with someone for so long to maybe not try like you used to. I fully admit to throwing my hair back into a ponytail almost every single day just because I'm tired of it being in my face. I work from home so there are days where I don't even put on makeup or think about it. And maybe none of these things are exactly like Grace but they add up to the same thing. You forget sometimes to take care of yourself. To do things just for you and not your children or even your husband. Sometimes you lose a piece of yourself without even realizing it....and this all just hit home for me so much. I'm very grateful that I don't have Grace's experiences but this book was a reminder to take care of me too. So much emphasis at times is to take care of your children's needs, your husband's, and everything else in life but who is there to remind you to take care of you? I'm rambling now but ugh - this book just was so spot on with real life! I absolutely could not care more about these two women and the problems that they were facing. I just immersed myself within their lives and within the pages of this book. I loved everything about this book and even the things that I didn't expect to. The author took chances where in other books I might not usually have liked the decisions the characters were making but it worked in this book. And worked perfectly if I do say so myself! Overall, I enjoyed this book so much that I actually wasn't ready for it to end. I'm so curious to see other reader's thoughts and reactions to this one. I understand why I enjoyed this one so much but am eager to see if others feel the same! This is only my second book by Sarah Morgan but it certainly won't be my last. I kind of want to read everything and anything that she has written now after loving this one so much! Gah! It was just so perfect for me and gave me all of the emotions. This is a book that I think I would easily reread a few years down the road. If I connected to this one now, I can only imagine how I would feel in a few years when my kids are getting closer to the age of going to college and moving out. I obviously cannot say enough good things but I highly recommend this book. This isn't just a romance book but I'm sure romance readers would enjoy it. I think that readers who enjoy women's fiction or just fiction in general should give this one a shot. Also, someday I simply must go to Paris to experience it all for myself! This was SO good! Bottom Line: A reading experience that I won't be forgetting any time soon! Disclosure: I received a copy of this book thanks to the publisher as part of a Goodread's giveaway. Thoughts are my own. Sam, I'm glad you enjoyed reading this book. I enjoyed reading your glowing, enthusiastic review! Thanks Suko! I really, really enjoyed this one!! I have only read one book by Sarah Morgan and I loved it so much. This sounds just as good. I can't wait to read it! Wendy, this is actually only my second book by her as well. I’m really looking forward to reading more by her now though!! Oh I'm so glad to see how much you enjoyed it! The blurb sounds like something I'd love and I adore Morgan at her best which this sounds what this is. Katherine, this one just hit home with me perfectly which is one of the reasons why I enjoyed it so much!! !